Nothing could be creamier, or easier than a simple Alfredo Sauce. I added both shrimp and chicken to mine this time as that’s what I had on hand, but you could also leave the meat out to suit a vegetarian palette. This sauce takes mere minutes to prepare and it absolutely divine – I won’t say that it’s low in fat but as an occasional indulgence, why not? In a large frying pan, saute the garlic in the butter for about 2 minutes over medium heat. Add the cream and whisk to incorporate. 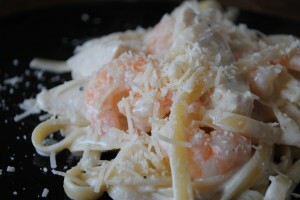 Add in fresh grated Parmesan cheese, cooked shrimp and cooked chicken. Keep stirring over medium heat until the cheese is melted and the sauce is hot and has thickened a little. Add in cooked noodles, coat the noodles with the sauce and plate immediately.